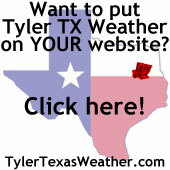 Should you have any questions or comments about Tyler Texas Weather, please complete the form below, then click on the Submit button. We will get back with you as soon as possible. Thank you for contacting Tyler Texas Weather.